Buckling Up: Are Seat Belts Necessary for School Buses? Initially, it may seem as though this is an obvious question-laws requiring seat belts in cars are meticulously enforced in the United States. As a result of education and enforcement, seat belt use in the United States averages to about 86%, ranging from 66.5% in South Dakota, to 96.9% in Washington as of 2012. According to the Center for Disease Control (CDC), seat belts reduce 50% of deaths caused by car accidents. And yet, despite these statistics, a poll conducted by the National Education Association’s NEA Today magazine showed that 53% of respondents favored seat belts on school buses, whereas 47% did not . Given the aforementioned context of seat belt use U.S., these results are not necessarily intuitive. In fact, they open the door a debate about whether or not buses have different safety needs than cars. In a 2006 Texas bus crash , a school bus overturned resulting in twenty-one injuries and the deaths of two students. Among the injured was a seventeen-year-old girl who was hurled out a window, landing so that her arm was stuck underneath the fallen bus. In yet another accident in February 2012 in New Jersey, a bus carrying twenty-five students collided with a truck resulting in seventeen injuries and one death. What is unique about the latter incident is that New Jersey is one of six states requiring school buses to have seat belts, whereas in Texas, school buses are not required to do so. Federal law requires that any vehicle weighing more than ten thousand pounds (like school buses) is not required to have seat belts as their high inertial capacity makes them less vulnerable to damage in a collision. The decision to include seat belts in such vehicles has been left to the discretion of the states, where the debate ensues. However, in light of the disproportionately lower statistics associated with bus accidents, most state legislatures and the NHTSA have decided that the cost of installing the seat belts is not a cost-effective investment. According to a 2002 study by the NHTSA, compartmentalization was found to be effective in lowering the incidence of severe injuries, without the heavy costs associated with installing seat belts for which there is a projected loss of 104 to 125 million dollars. 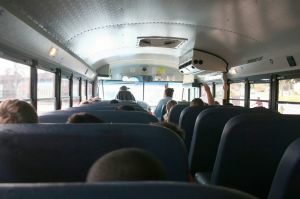 In addition, the National Education Association brings an interesting angle to this, explaining that bus drivers are generally opposed to the implementation of seat belts as well, citing that there are significant liability issues that are difficult to control and prove: children could unfasten their seat belts during the bus ride when the driver cannot enforce the rule . California is one of six states requiring seat belts in school buses, and the only state in the country requiring lap-shoulder belts in new school buses. To resolve the issue of liability that concerns bus drivers, the state’s legislation explains that charges cannot be brought against the driver if a student has improperly fastened his/her seat belt, or does not fasten the seat belt at all. However, the law requires that the passengers are trained on how to use the seat belt, thereby placing a notable amount of personal responsibility for one’s safety. As for the problem of cost, most of California’s schools primarily transport elementary school students and not high school or middle school students. As a result of this, the costs associated with seat belt installation are reduced in proportion to the fewer number of buses in which to install them. Nonetheless, California is unique in this requirement. Most states cite the studies performed by the NTSB and NHTSA as grounds to consider the benefits of seat belts insufficient to warrant the expenditure. On one side of the debate, school buses are said not to need seat belts on account of their structural design. According to the National Transportation Safety Board (NTSB), school buses have a compartmentalized design that renders seat belts unnecessary. Instead, the tall, cushioned seats that are closely spaced together “effectively lower injuries” experienced by passengers resulting from a violent, forward motion in the case of a frontal collision. In addition, buses are said to be safer because they get into fewer accidents than cars, accounting for only 0.2 deaths per one hundred million vehicle miles traveled, compared to 1.44 deaths experienced by cars for the same unit of miles traveled. Blueford, one of the major manufacturers of buses, points out that children are twenty times more likely to be fatally injured in a car crash on their way to school than they would be on a bus. However, statistics are not always as clear cut as they seem. A 2002 study by the National Highway Traffic Safety Administration (NHTSA) demonstrated that neither the compartmentalization nor presence of seat belts can independently improve safety. Art Yeager, a school bus safety advocate, points out that NTSB statistics are not a complete representation of the advantages buses may have over cars. In contrast with cars, buses are only on the road 180 days of the year, during the early morning hours whereas cars are on the road all day and all year including the statistically accident prone summer. And noticeably, there are more cars than there are buses on the road possibly explaining why there may be more instances of car accidents than bus accidents. These mediating variables convolute the statistical analysis by the NTSB, and further the debate. The New Jersey crash presented a unique opportunity for analysis of the effects of seat belts. In the bus crash that occurred in 2012, some students were wearing seat belts, while others were not. Remarkably, the bus had a functioning camera in the interior of the vehicle that captured the events leading up to, and following the crash. This unique set of data was then used by doctors from The Children’s Hospital of Philadelphia to analyze the effects of the impact on the children and compare the relative severity based upon whether or not the child was wearing a seat belt. Even in this analysis however, it is important to keep in mind that because there were different points of impact-when the tractor hit the bus causing the bus to spiral into a pole-a possible challenge in the doctors’ assessment may have been the uneven distribution of force amongst the passengers. Nonetheless, the doctors reviewing the video concluded that the compartmentalized designs of school buses do little to protect a side collision, and that seat belts that restrain both the lap and the shoulder are essential to preventing severe injuries. The seat belt debate is highly polarized, with several studies pointing to starkly different answers. Regardless, the issue and concern of safety is a universal one, especially when it comes to driving in motor vehicles whether it is a bus, car or truck. If you have suffered injury while either on a bus or a car get in touch with the Brod Law Firm. Mr. Brod has extensive experience representing people involved in vehicular accidents as they seek to remedy the situation.